Simon states "I think God made me the way I am for a reason"(Simon Birch). Simon is a round and dynamic character. Simon is very outgoing and he doesn't show that he is ashamed that he is smaller than everyone else. He believes in God and that everything happens for a reason. He is opinionated and defensive with the Reverend, and other adults that don't think that Simon is a normal person. He also doesn't like the way Reverend Russell and Miss Leavey portray God. In the beginning Simon said what he wanted and was still finding out what his destiny, and his purpose in life was and at the ending he found his purpose. Simon says "I want to be certain but I'm not sure, I want you to tell me that God has a plan for me" (Simon Birch). This proves that Simon wants to be certain that God has a plan for him and to know that he has a purpose. Simon believes that there are no accidents that God planned everything. When Simon hit the ball and it killed Joe's mom he believed that it was God's plan for that to happen and it was out of his hands. I get called up to bat, and the coach tells me to swing away. I don't swing at the first two, they were to high. 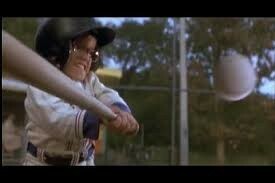 The pitcher pitches the ball and I swing and I hit it!!! The trill of hitting the ball was so great. Then I see it going over the fence in the direction of Joe's mom. Then it hit her, a rush of nerves ran through my body. When the coach said she was dead, my heart sank. My first thought was what have I done then I was thinking about Joe. It was the worst feeling in the world, nothing could compare to what I felt. I went into Father's room I was in there for one thing, my baseball cards. I saw the box up in the tallest cabinet, so I climbed up. After I grabbed the box something caught my eye... It was the baseball and I knew right then and there that Joe's life was going to change. I had to tell him, I promised him I would and so did Ben. So I got Ben to drive me to Joe so I could tell him myself. When I got there I could tell something was wrong. When Joe asked if Reverend Russell was lying I didn't say anything. We went down towards the water to talk and all Joe said was that he wished he didn't know, that he wanted things to go back to normal. I didn't know what to say or what he wanted to hear so I just agreed with him. When the bus started to swerve I knew we were in trouble. I was terrified but I knew I had to stay calm so the little kids wouldn't be scared. When the bus went into the water I thought for a moment then took action. I told the little 3rd graders that I would make sure they would be okay and then I told them what the plan was. We got all of them out then I recounted and we were missing one. I had to go back in! I was going to be a hero. I got in there and found him, his foot was caught on a pole. I got it out but then the bus started to tip and it was sinking farther into the water. We went to the back and the door wouldn't open. The water was so cold but I was trying so hard to save his life and mine that it didn't phase me. He got the window open and got out. I was still in there I tried to grab Joe's hand but I slipped and the bus sunk all the way under. I couldn't hold my breath any longer. The next thing I remember is hearing Marjorie say that she thinks that what I did was really brave and she called me a hero, that's what I have been wanting to hear my whole life. But even better she kissed me!!!!!!! When Joe came in the first thing I wanted to know was if the kids were okay. I made Joe promise that he would take my baseball cards. I told him he had to go, the last thing I heard before I died was see you later crocodile.